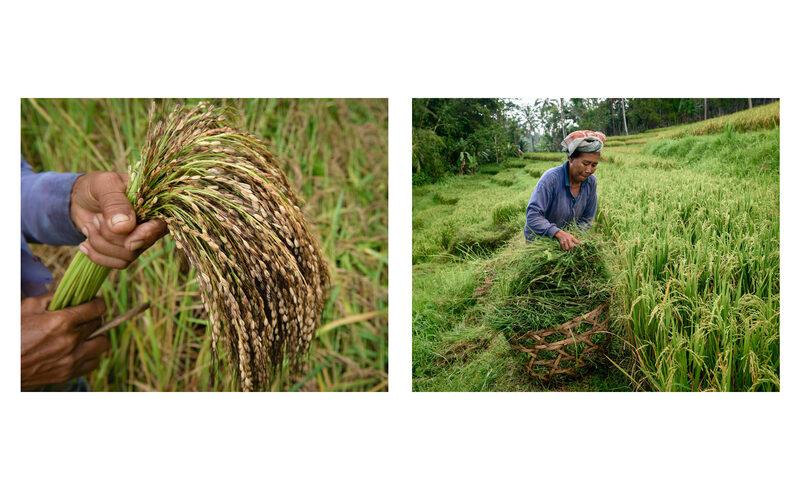 Traditional Balinese rice is only grown today in the highlands, which escaped the forced introduction of hybrid rice varieties that began in the 1970’s. The panel on the left shows traditional rice, which requires little or no chemical fertilizers because it slowly absorbs nutrients from the volcanic landscape. The panel on the left shows the harvest of hybrid rice in a field located halfway down the volcano Mt Batukaru. This rice grows twice as fast as the Balinese rice, but is much more vulnerable to endemic rice pests.